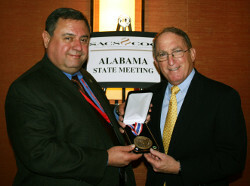 Retired U.S. Marine Corps Gen. Charles C. Krulak (right), the 31st commandant of the Marines, receives his 2011 Theodore Roosevelt Meritorious Achievement Award at the Southern Association of Colleges and Schools annual meeting in Orlando from Dr. T.J. Rosandich (right), the Academy’s vice president and chief academic officer. Retired U.S. Marine Corps Gen. Charles “Chuck” C. Krulak, the former 31st commandant of the Marines, accepted the United States Sport Academy’s 2011 Theodore Roosevelt Meritorious Achievement Award for his longtime contributions to sport. Now, he is the president of Birmingham-Southern College where his leadership is expected to further enhance the university’s reputation as one of America’s finest liberal arts institutions. Krulak, who has distinguished himself as an athlete, Marine and businessman, received his award on Sunday, Dec. 4 at an annual meeting of the Southern Association of Colleges and School in Orlando. Dr. T.J. Rosandich, the Academy’s vice president and chief academic officer, presented the award. Krulak was a standout wrestler at the U.S. Naval Academy and at Phillips Exeter Academy in New Hampshire. He earned induction into the National Wrestling Hall of Fame in 1996. A 35-year veteran of the Marines, Krulak was appointed in July 1995 as the 31st commandant of U.S. Marines Corps and was a member of the Joint Chiefs of Staff. He retired from the post in June 1999 and is credited during his tenure for annually increasing the USMC share of the Department of Defense budget by $1.5 billion to initiate a modernization effort that continues to benefit troops today. Krulak’s military career included two tours of duty in Vietnam, serving in the Persian Gulf War and being the commanding general of the 2nd Force Service Support Group at Camp LeJeune, N.C., during the Gulf War. His military honors include the Defense Distinguished Service Medal, the Navy Distinguished Service Medal, the Silver Star Medal, three Bronze Star medals, two Purple Heart Medals, the Meritorious Service Medal, and the French Legion of Honor, among many others. After his retirement from the military, Krulak was named in 2001 as chairman and chief executive officer of MBNA Europe Bank in Chester, England. There he spearheaded a financial turnaround for the third largest credit card provider in the United Kingdom and the largest credit card provider in the Republic of Ireland. In 2004, he joined MBNA America Bank N.A. in Wilmington, Del., as vice chairman and chief administrative officer, where he was responsible for corporate development and acquisitions, personnel and education for the Fortune 500 company. The Academy’s Theodore Roosevelt Meritorious Achievement Award is presented annually to an individual in any amateur or professional sport, past or present, who has excelled as a contributor to both sport and society over at least a decade.